Employee empowerment may be the most underutilized tool in all of customer service. Too many organizations have a gap between the autonomy and authority they grant their frontline teams and the amount that they realistically could grant. Often, that gap is quite large. Yet, the difficulty individuals and organizations have empowering employees is understandable. It is the nature of individuals to be risk averse, and it is the nature of organizations to create rules to prevent problems from recurring. Both of these dynamics combine to restrict employees and the actions they are allowed to take to make a positive impact on the customer experience. It is the natural gravitational pull of every organization to move towards more control and less flexibility. That pull is constantly working in diametric opposition to empowerment and can only be countered through conscious, proactive action and leadership. Empowerment rarely occurs naturally and almost always requires some sort of institutional backing and concentrated initiative. Only once a culture of empowerment is firmly established can empowerment grow naturally and even then it must be nurtured and monitored, because even in the most empowered organizations the tendency to create more controls is strong. So, let’s get started with Chapter 1: What Is Employee Empowerment. CHAPTER 1: WHAT IS EMPLOYEE EMPOWERMENT? It is important to note that the dictionary definition above does not take into account a key distinction between two types of empowerment: actual empowerment, that granted by the organization to an employee, and psychological empowerment, the feeling of empowerment that an employee has. Academics studying the subject generally approach the two types of empowerment as separate and distinct phenomena. For the purposes of this guide, you should simply note that there is a difference between actual and psychological empowerment and understand that even when you grant employees more power and authority, they still might not feel empowered. And when employees don’t feel empowered, they are unlikely to act empowered. Without psychological empowerment, actual empowerment is of limited value. A good amount of research into employee empowerment has been conducted in the past few decades. This research has produced a variety of findings, and one theme that seems to be fairly universal is that empowerment is a win-win-win for employee, customer and organization, generally resulting in higher job satisfaction and better customer experiences. According to a study by Gopesh Anand and Dilip Chhajed, professors of business administration at the University of Illinois, frontline employees who perceive a high degree of autonomy in their jobs and trust their leaders will commit to improving their organization. All too often, empowerment is spoken about in lofty, abstract terms. Empower your employees, and they will make the right decisions. It is presented as a magical idea — a panacea that cures all service ills. However, empowerment is not about feel-good platitudes; empowerment is a decision about risk and reward. This is why I believe in Smart Empowerment. Smart Empowerment: Empowerment that strategically allows employees to impact the customer experience positively through real-time decision making and authority while limiting the amount of financial, legal, and operational risks the firm is exposed to. Actual empowerment is contextual, and its limits should reflect the balancing of the expected rewards with the potential risks. For instance, should all entry-level cashiers at a grocery store have the ability to comp any purchase up to $25.00? Maybe. Should all entry-level cashiers have the ability to make wire transfers from the company’s main account? Definitely not. Obviously, this is an extreme example used to make a conceptual point: employee empowerment always has limits; it’s just a question of what they are. The second aspect of smart empowerment is operability and scalability, meaning that the empowerment granted works well within the framework of current operational processes and is scalable across similar job functions throughout the organization. Organizations must ensure that employees can succeed with the authority and responsibility they have been granted by making sure that it works on the front lines in an effective and easy-to-implement fashion. While empowerment should be implemented with heart and enthusiasm, it should be analyzed dispassionately, which is why we created this handy brainstorming tool for looking at empowerment in your organization. The Empowerment Wheel below breaks down some of the most common categories of actual employee empowerment. Each piece of the wheel is color coded to indicate the potential riskiness of empowerment by category. It is important to note that these risks are extremely broad and will vary greatly by industry and company. The risks are also highly relative; something that is labeled an intermediate risk could be much less risky than something which falls under a low risk category. For instance, an employee who is empowered to create customer-facing signage for your store (minor operational matters) and writes something inappropriate on it, can do a lot more damage than an employee allowed to sign contracts valued at under $1,000 a year (legal). 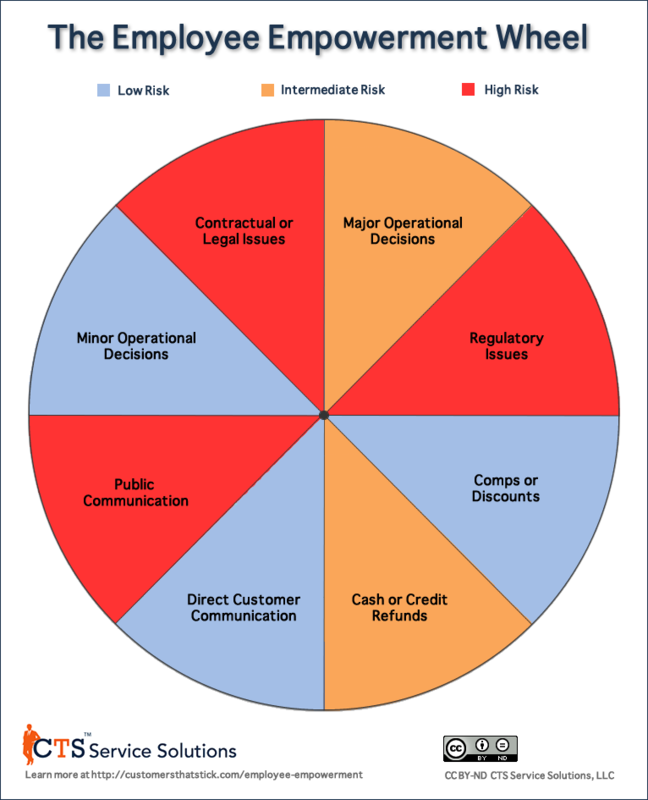 The categories are designed to represent a general way to view categorical risks across industries but must be adapted to you own industry, organization, and most importantly, the specific nature of the authority and powers being granted. The Empowerment Wheel is a brainstorming tool — a graphical tickler for you and your team to consider the various types of empowerment and the potential risks that come with them. It is meant to remind you that empowerment can have unintended consequences and to help you be more tactical and thoughtful in empowering employees. In the end, each specific way you empower employees should be viewed through the lens of upside and downside, risk and reward. So, now that you’ve got the idea of risk management firmly placed in your mind, let’s look at 9 tips that can help you in empowering your employees to create better customer experiences. Where in our customer’s journey could a more empowered employee enhance the customer’s experience and provide more effective customer service? One you’ve identified the most common touch points where customers are encountering resistance, then simply evaluate what authority team members could use to improve these moments. As you work through the process of finding these improvements, keep in mind the 9 tips below. Few people enjoy being micromanaged, and few employees prefer reporting on their job instead of actually doing their job. It’s hard to reduce the hassle-factor for customers when your own team’s experience is hassle-filled instead of hassle-free. Look at the processes that have accreted in your organization over time and which take your employees’ time away from serving customers. How many signatures does process X need? How many forms does process Y take? How many layers of escalation does situation Z require? While the devil is inevitably in the empowerment details, one of the fundamental early steps is looking at the time your team spends trying to get its job done instead of the time it spends actually getting its job done. Actual empowerment can be broken down into two types: job enlargement (horizontal) and job enrichment (vertical). When looking at empowerment, evaluate opportunities both horizontally and vertically. Job Enlargement (horizontal) — Expanding job responsibilities to include more responsibilities typically found at the same level. For instance, the employee is no longer constrained by helping customers in their own department but in every part of the service floor. Job Enrichment (vertical) — Expanding job responsibilities to include responsibilities typically found at a higher level of the organization. For example, the same employee is now given the ability to process customer refunds without a manager signature. If your culture has not been one of empowerment, turning the ship around will take time. Team members will need to accept that they can make decisions on behalf of the customer’s welfare without negative repercussions. They need to feel psychologically empowered and to do that they have to feel that you trust them to make decisions. Nothing communicates trust like an employee asking for permission or advice and being told that you have faith in them to handle it. But remember, Rome wasn’t built in a day. The less empowered they have been in the past, the more difficult it will be to make them truly feel empowered. While empowerment transcends mere monetary solutions, giving employees the ability to resolve issues on the spot with some sort of compensatory gesture can be a powerful tool in preventing issue escalation. This is the principle the Ritz Carlton uses with its $2,000 Rule. I used a similar principle many, many years ago in a retail service business of mine. Like many small businesses, we had controls in place that required escalation for most refunds or comps. It was obvious that it wasn’t working. Management time was being taken up and customers were waiting days for a resolution, sometimes over just a few dollars. So, we tried giving every front desk employee the ability to comp a number of levels of service up to and including a full refund. We created a simple online form that they could fill out on the spot to report what they gave and why (less than a minute to fill out). We decided we would test it for a few months to make sure that the program was financially viable. It was a complete success. Our team was more protective of “giving away the store” than we ever would have been, and the number of issues that were resolved on the spot and did not both result in further frustration and hassle for the customer or take up valuable supervisor time increased significantly. Creating an allowance for resolving customer issues is great but you also want to allow for creativity in creating positive proactive customer experiences. It was empowered employees who created this great birthday surprise for my wife at the Hotel Indigo in Asheville, NC. It was an empowered employee who made national news because he stopped to teach a young man buying a tie for his first job interview how to tie it. None of these great customer experiences would have occurred in an environment where the team members were not able to make such gestures without fear of being second guessed. With empowerment, it’s easy to set it and forget it. Once you’ve granted the empowerment, it is easy to think that it will take care of itself. This is often a dangerous way to think. From the standpoint of risk, you will always have unintended consequences that you can’t foresee. No matter how hard you tired to evaluate the risks before granting certain authority and responsibility, you were still forecasting. Once it’s being used in the real world, you have to monitor it to make sure that risks you did not foresee have not arisen. On the execution side, it’s very easy for empowerment to be forgotten, for systems to fall into disuse. In the previous example, where we granted empowerment in one of my retail businesses, after many years of successful use, I noticed that the reports were no longer coming in. Since I wasn’t actively managing the operations of the business, it took awhile before I caught it. It turns out that employees were not using the empowerment they had been given, and we had to do a reboot to get it rolling again. Customer feedback can be powerful when integrated with employee empowerment. First, the feedback can be used as a coaching tool to help identify areas where the authority could have been used differently or more effectively. You’ve identified a problem and an easy solution where some form of empowerment (the front lines are given the form, the assistant manager gets a key to the office, etc.) can easily prevent the issue. In a similar vein, it is important to involve employees in developing their own empowerment. According to Luis Delfin, co-author of a study performed by Gopesh Anand and Dilip Chhajed, executives should not simply push new “employee empowerment programs” down to the front lines. Collaborate with your teams on what authority they need to better serve customers. If empowerment comes from on high, from a vacuum that does not take into account the attitudes of the empowered, you may find that the autonomy you give them is not the autonomy they need. Collaborate with your teams on the empowerment process; you will get buy-in and valuable feedback as to what is needed. All the autonomy and authority in the world is wasted if an employee does not have the training or desire to use it to create better customer experiences. If an employee does not operate in a culture that tells him or her to look for opportunities to make the customer happy, to look for ways to solve the customer’s issue before it quickly snowballs into a more serious one, the empowerment they have at their disposal will sit idly and will be of no benefit to them or your customers. Make sure that your team doesn’t keep its authority parked in the proverbial garage and that they take it out and drive it regularly. Employee empowerment is an effective and powerful tool for creating more rewarding experiences for your employees and customers alike. Done smartly, with an eye towards risk management and customer-centricity, empowerment can give employees the tools and authority they need to make customer experiences more successful and operations more profitable. By its nature, empowerment starts at the top. Empowerment must first be granted by those who have the power to do so but then it must be embraced by those who have been given greater authority. It must come from a leadership team dedicated to giving up control in exchange for the benefits that come from an empowered team. Once leadership has committed to empowerment, for an empowerment initiative to be effective, there must be buy-in throughout the organization, buy-in that will come from collaboration and shared objectives. Leadership must help bridge the gap between actual and psychological empowerment. Don’t just give your team the power, make sure they truly feel empowered. If you can create a team that is both empowered smartly and which is ready to use their empowerment to improve customer experiences, you, your employees, and your customers will all find that empowerment works wonders for transforming an organization from average to Hero-Class®.